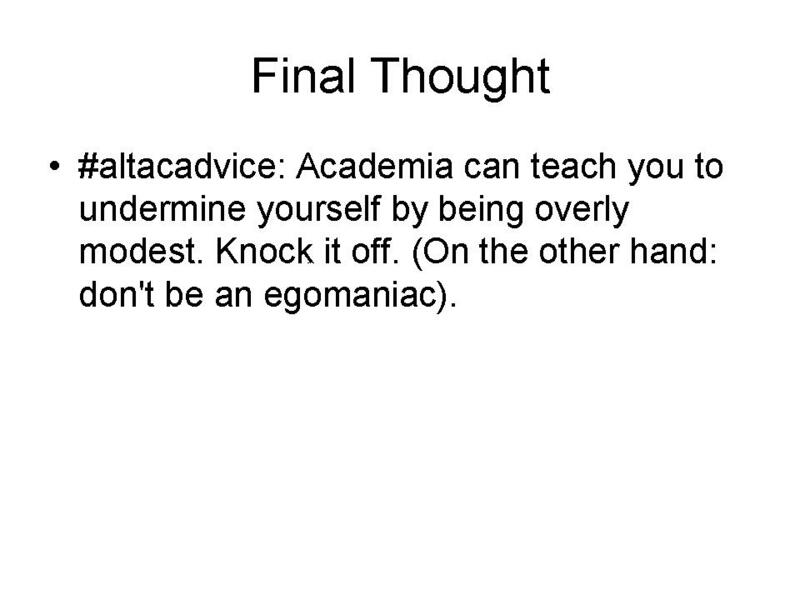 The following slides and notes guided my presentation for the #alt-ac: The Future of ‘Alternative Academic’ Careers roundtable at the 2012 MLA convention in Seattle. I was grateful to be invited by the MLA Office of Programs, and pleased to join Bethany Nowviskie (UVA), Donald Brinkman (Microsoft Research), Neil Fraistat (UMD), Robert Gibbs (Univ. of Toronto), Charles Henry (CLIR), and Elliott Shore (Bryn Mawr) for the discussion. The bulk of the roundtable was organized toward discussion, but we each took about six minutes to discuss alt-ac from our individual perspective. This panel followed another alt-ac roundtable session which immediately preceded it. Both were written up by William Pannapacker in the Chronicle of Higher Education. 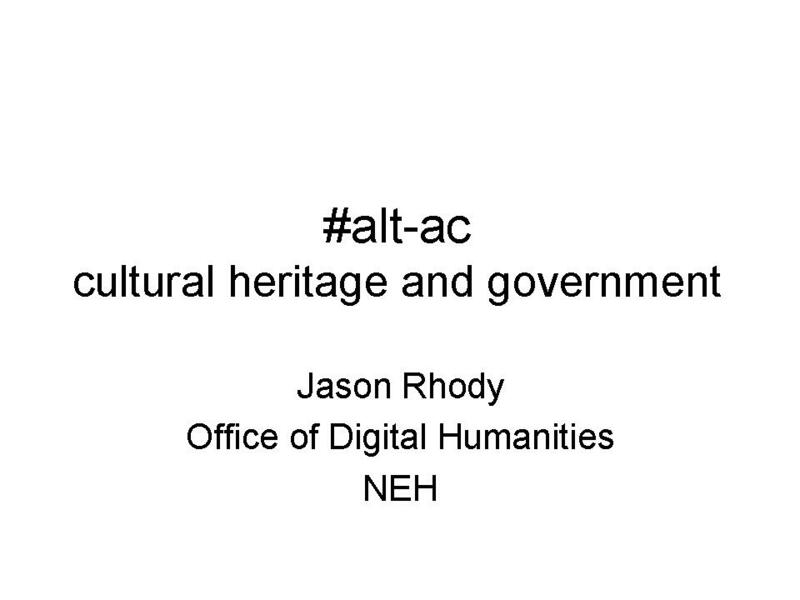 I say it elsewhere, but it is worth repeating: opinions expressed are those of Jason Rhody and do not necessarily reflect official positions of the National Endowment for the Humanities. Thank you to Bethany and the MLA for organizing this session. 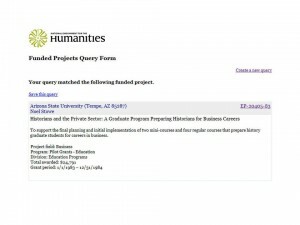 Concerns about employment for humanities graduates are not new, even for organizations like the NEH. 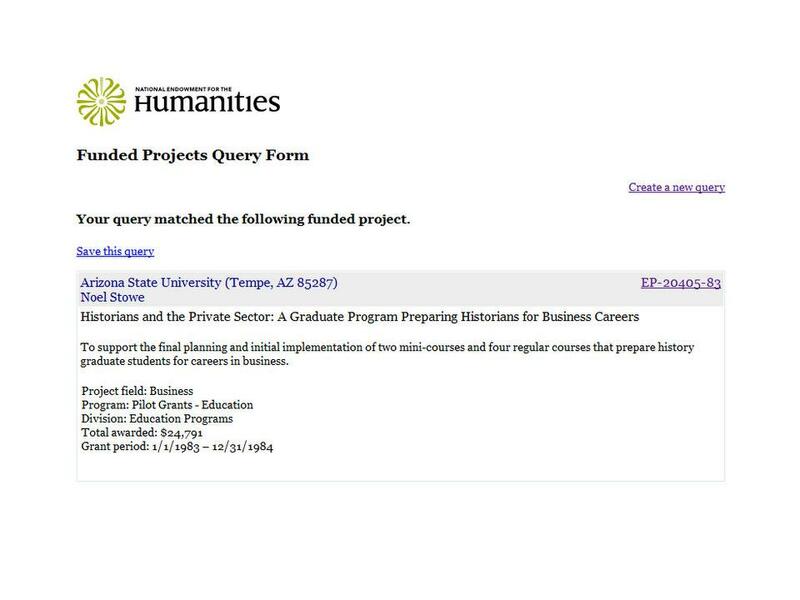 There was even some alt-ac in 1983, as you can see in this grant made to Noel Stowe with the title “Historians and the Private Sector:: A Graduate Program Preparing Historians for Business Careers” (discovered by Brett Bobley when making some changes to how we categorize our grants). Fast-forward approximately three decades, and we can point to discussions of employment and professionalization in a slightly different context: digital humanities centers. 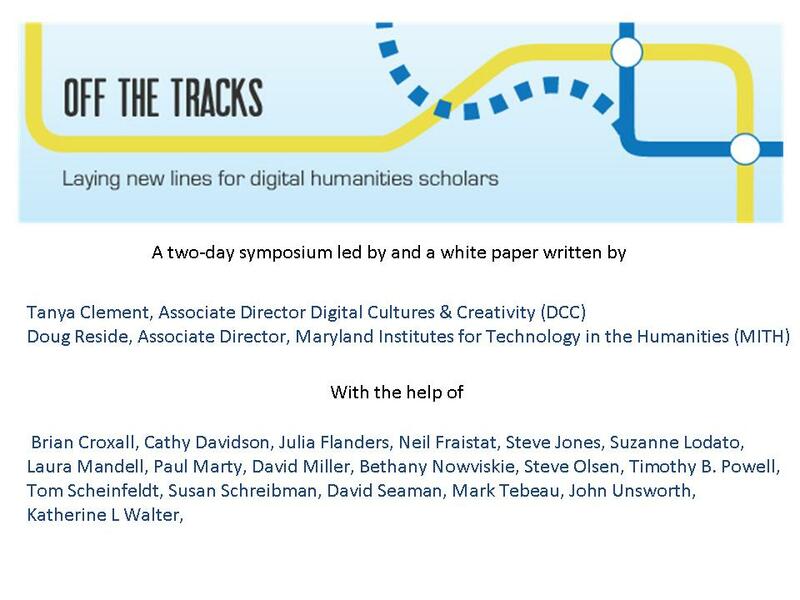 In 2010, Tanya Clement and Doug Reside (then both of UMD) hosted the NEH-funded workshop “Off the Tracks—Laying New Lines for Digital Humanities Scholars.” The workshop outcomes are discussed in full in their report (and I suspect that Neil Fraistat will offer some thoughts here as well), but it’s worth noting that alongside the crisis of humanities employment that we also see a shift in the academic ecosystem that supports and works alongside faculty in today’s colleges and universities. 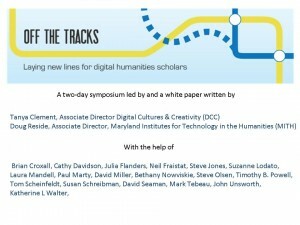 I’m personally interested in this as an ‘alt-ac’er’ myself, and particularly invested in theorizing how we might go about reframing how we think about ‘service’ in and alongside the academy, and, further, how this relates to the rise of the public humanities (a trend we’ve seen a great deal of through the various grants funded in recent history). I’m also particularly keen to discuss how reframing service allows us to uncover these hidden networks of collaboration (with librarians and archivists for example) so often obscured by the myth of the solitary scholar. 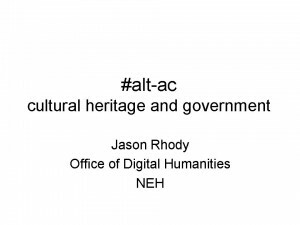 Given this somewhat tongue-in-cheek title, this might be an appropriate time to remind you that this presentation is a reflection of my own opinion, and does not reflect the opinion or position of the NEH. Disclaimers are one of the things I’ve had to get used to working in government service – and so this serves both as a disclaimer, and also my own caution that alt-ac comes with tradeoffs. 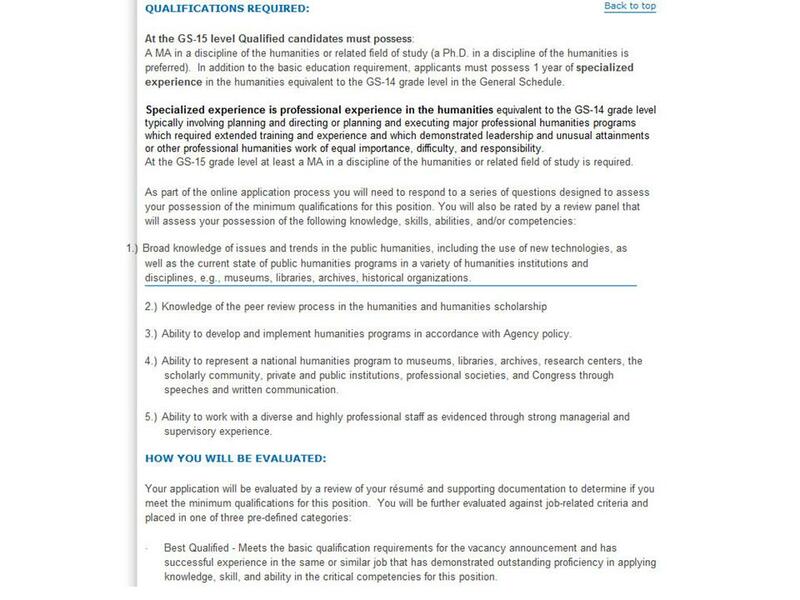 I think it’s exciting that these kinds of positions are getting increased attention, and that scholarly societies like MLA and the AHA are working to make them more available, attractive, and rewarding. But I’m also wary of being overly Pollyanna. These are jobs, and no matter how much you love your job, all jobs come with certain challenges and restrictions (again, I’d be happy to talk more about that later). So, here are a few tips as you consider alt-ac employment. I hope you find them useful whether you are a current graduate student, currently seeking employment, or an advisor how might help students look for these kinds of jobs in the future. 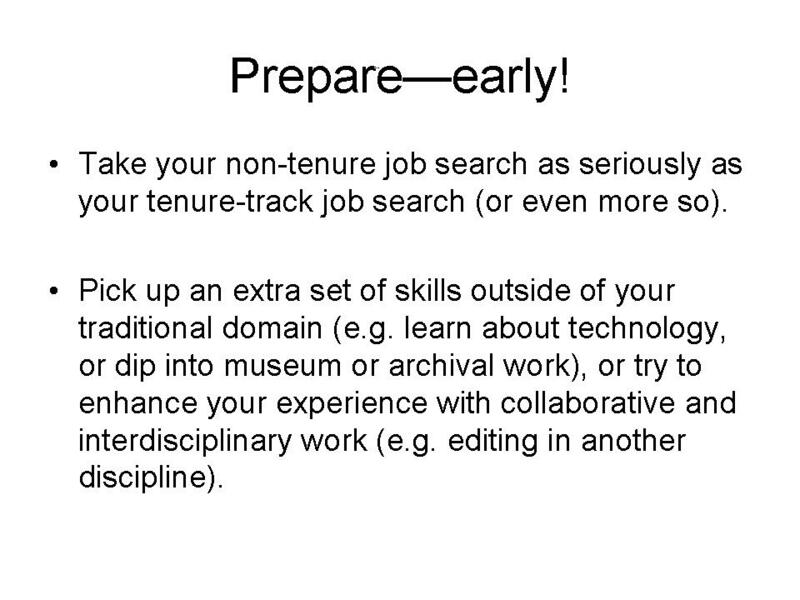 •Take your non-tenure job search as seriously as your tenure-track job search (or even more so). •Pick up an extra set of skills outside of your traditional domain (e.g. 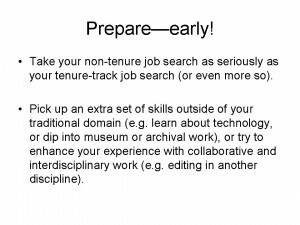 learn about technology, or dip into museum or archival work), or try to enhance your experience with collaborative and interdisciplinary work (e.g. editing in another discipline). 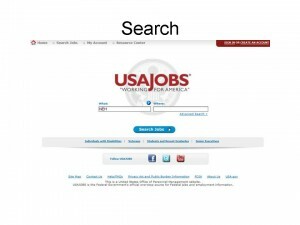 Search for government jobs at http://www.usajobs.gov/. 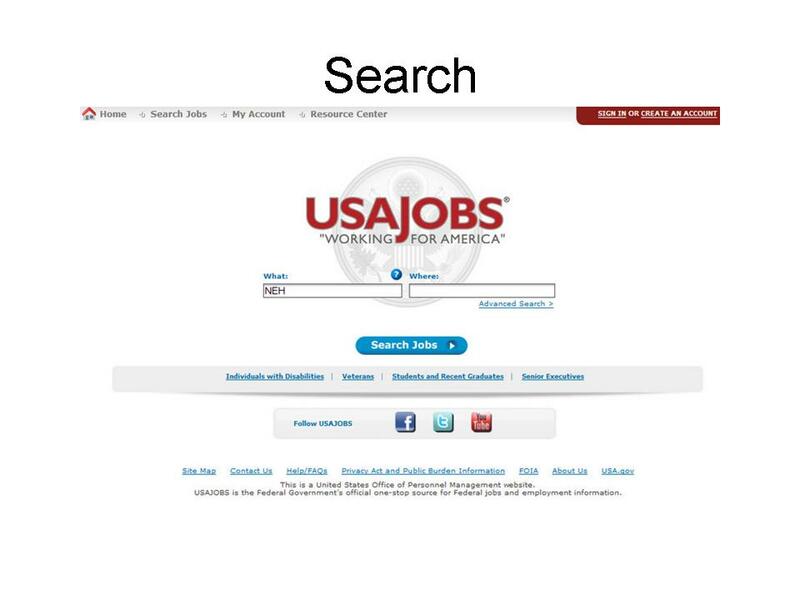 You can search by keyword, but also try searching by agency (NEA, NEH, NSF, IMLS, Smithsonian, NHPRC, NARA, LOC). Explore working for the government while still in school (http://www.studentjobs.gov/) or consider opportunities such as the Presidential Management Fellows program (https://www.pmf.opm.gov/). 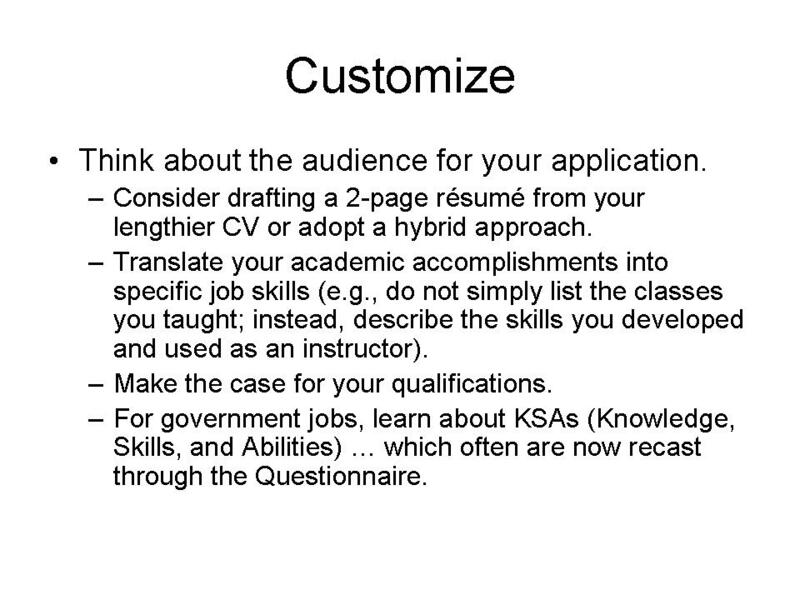 Think about the audience for your application. 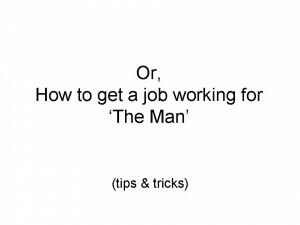 –Consider drafting a 2-page résumé from your lengthier CV or adopt a hybrid approach. –Translate your academic accomplishments into specific job skills (e.g., do not simply list the classes you taught; instead, describe the skills you developed and used as an instructor). 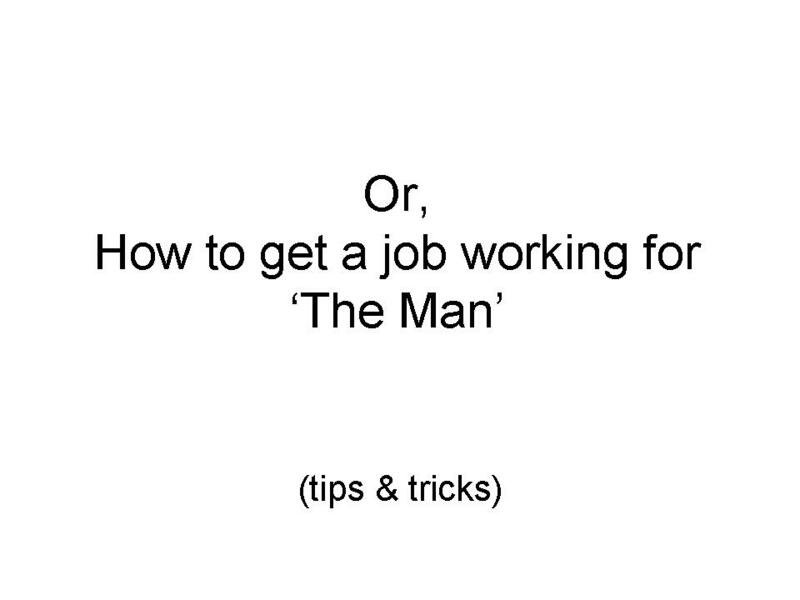 –Make the case for your qualifications. –For government jobs, learn about KSAs (Knowledge, Skills, and Abilities) … which often are now recast through the Questionnaire. What were KSAs? 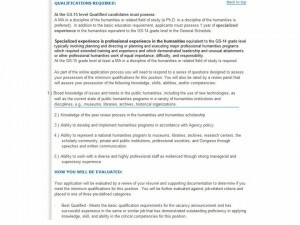 The acronym stands for Knowledge, Skills and Abilities, which were essay statements that were frequently required along with a resume when applying for government jobs. KSAs are no longer officially used, per se, because of changes in hiring practices during the Obama adminstration. 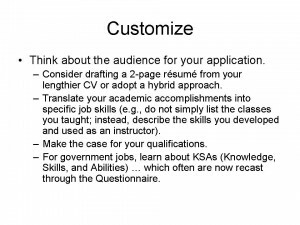 However, many Human Resources offices – which is usually the first group that evaluates all incoming applications up until they draw up a short list for the ‘selecting official’ – have been using KSAs for decades, and that just doesn’t go away (as you can see under “how you will be evaluated” in the slide below). Instead, KSAs are often reintroduced (though not by name) through a questionnaire often required during the application process. Be sure to check the advertisement for a sample questionnaire so you can prepare your answers early. 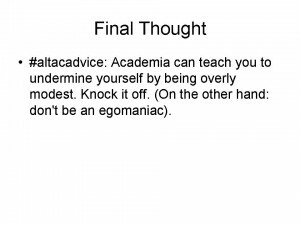 Brian Croxall asked around for advice a few months back on Twitter, and this was one of my contributions. I think it’s an important one, especially in the context of how Human Resources departments ‘score’ applications … which ultimately leads to getting – or not getting – an interview. Don’t overpromise, but don’t undermine yourself either.